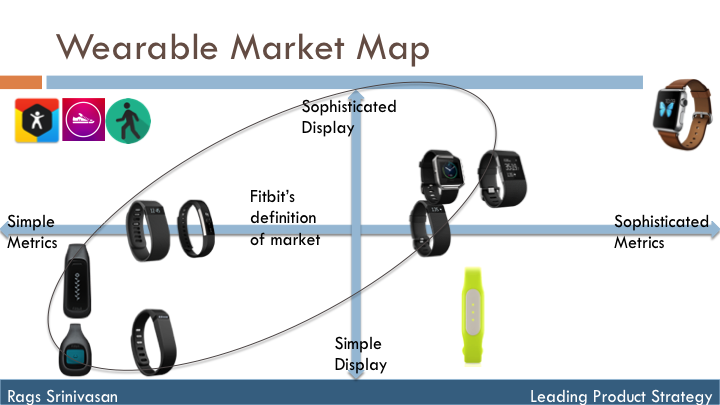 In my last article I showed a mapping of Fitbit’s different product versions and why they are getting disrupted from all sides. A specific point in that article is worth expanding on – it is the number quoted by Fitbit CFO on its 90% market share. Before discussing the implications of this high level of share let us do the numbers. From this perspective they exclude considerable swath of customer spend. More importantly they do not include a large portion of the top right quadrant, the premium sector, where lots of market value is created. In this part of the market Apple watch dominates customer preference. In the last quarter Apple likely made $1.5 billion to $2.3 billion in Apple Watch sales*. That is just one quarter. So to say Fitbit has 90% share of $2.38 billion market does not fit the math. They have stated several times that they do not see Apple watch as a competition. So those numbers are completely left out of any market sizing estimates. Unfortunately we do not get to decide what our competition is, customers do. Products exist to fill a customer job to be done. Customers pay for those jobs from a budget. If they pay for Fitbit from the same budget as they would for Apple watch then it is a competition whether you like it or not. Even if we completely leave out Apple watch revenues, 90% share of any market does not bode well for any business unless it somehow has the magic to break it open 10X-20X because of its products. As I discussed in my previous article Fitbit is getting disrupted even in its narrow definition byproducts like Mi Pulse. Where does it growth come from when it already has 90% share unless the market grows and even if it did, can they defend their position? Rob Cihra, a stock analyst, mirrors my 2X2 product map and states that they should build more products to the far right side – build devices with more advanced metrics collection. That side of the market is dominated by Apple with $6-$8 billion annual revenue vs. Fitbit’s $2.15 billion. As it gets boxed in, despite its sensor reminding it to move, Fitbit will find it can only walk in place to get its counter to move. *Note on Apple Watch Revenue: Apple does not break out revenue of Apple Watch. It reports Other Hardware category revenue that includes iPod, TV, accessories and Watch. I recently did a break down of this Other Hardware revenue to estimate Apple Watch revenue. Last quarter Apple reported $4 billion in this category which points to the $1.5 to $2.2 billion range for Apple Watch.